These mealy bugs are being tended by an ant, Paratrechina. Photo take June 2, 2008, near Bumble Bee, Yavapai Co., Arizona on Canyon Ragweed (Ambrosia ambrosioides). 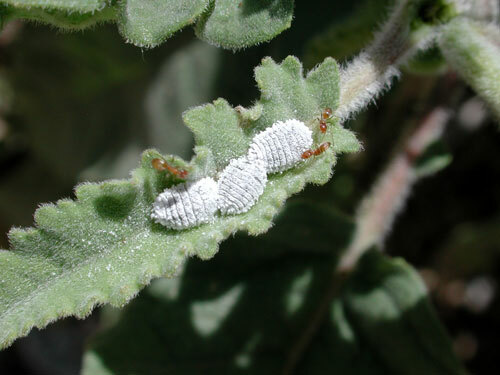 Mealy bugs are barely mobile insects with piercing-sucking mouthparts. Using their mouthparts like a straw, they draw watery sap from within plant stems that is sugar-rich, but protein-poor. This means that sugar is a waste product and must be excreted together with the extra water. Ants are always in need of a sugar fix to keep up their active life style so they protect and nurture mealy bugs in return for this waste product, honeydew. Mealy bugs have many natural enemies such as lacewings, lady bird beetles and parasitic wasps. As a result, in the absence of protecting ants they rarely become so abundant. The bright white coating on the mealy bug is produced from glands that convert excess sugar energy into fatty wax. Leaves and soft twigs often curl in response to mealy bug feeding.